we’re nuclear butterscotch… stop in and see us tonight! Grrr. There’s something up with my computer. We’ve been tinkering around with this for months, and we can’t figure it out. (Well, maybe we could if we were willing to embark on a costly process of elimination and buy several new pieces of hardware. For now, I’ll have to live with it.) Many a time when I’m surfing the net – rather, visiting all three or four places I visit day to day – it freezes up. This never happens when I’m working offline, like with Photoshop or looking through my folders. We installed Firefox for browsing, and it still happens from time to time. Anything I’ve been working on, such as .txt documents, if not previously saved, are kaput. That is part of the reason I haven’t been blogging as much. It’s just too frustrating to work on my blog stuff in a tiny browser window, and yes, I know that notepad documents are stupid and lame. Everyone has been telling me that for over a decade. And when EVERYONE is telling me something is lame, or great, I cling to or reject it, respectively. Today, I’m forcing myself to work on this (and try to remember everything I wrote yesterday) in a MS Word document, which saves every 5 minutes or so. My computer is three years old, and all of this is right on time, you know. It’s all downhill from here. Anyway. I’ve been thinking seriously about my future as an Etsy seller for a while now. I’m guessing the protest in May didn’t make any big shakes in the Etsy policy. I’ve made my best efforts to fall in love with selling on Etsy as so many people have. I love what Etsy is for, I enjoy the buying experience on Etsy, but from my standpoint as a seller, it feels too impersonal in some ways, yet too invasive in other ways. Or, if I wanted the Facebook experience, I’d sign up for Facebook. Whatever my reasoning, I haven’t been quite as motivated to list items for sale there these last several weeks. Maybe we have Regretsy to thank for that. Or maybe it just boils down to the fact that I enjoy the personal one-on-one contact I am allowed with my bead peeps when I sell on my website. Etsy sales feel so one-sided – you can read my descriptions (or this blawg) and find out what a goofball I am, but what about you? If you’re inclined to tell me, I’d like to know what projects you’re working on, what the kids are doing… At the very least, I get to hear directly from you at my web sales, and if you’re a new buyer, I can get an inkling of you and make a stronger connection to you and your preferences. I’ve found that to be much more difficult with Etsy sales, and to me, being able to make these connections (if only in my brain) is an important factor in my ability to provide better service now and in the future. When it comes to selling on a third party venue, oftentimes, all I know about you is your email address. If you want to say hello, you can “send a convo” and fill out a form – or you can leave a note when you make your purchase – and maybe I’ll see it or maybe I won’t. Not that I’m on the hunt for a bunch of new best friends, I just know that many folks enjoy having personal contact with the person who creates the items they’re purchasing. Sending a personal email instead of clicking a buy now button is, well, more personal. And I’m much more likely to see your email. So, I guess I’ve been working toward a specific goal more seriously than I’ve let on so far. These last few weeks, I’ve been working like mad on new stuff in between orders, and rather than listing these things on Etsy weekly, I’ve been sitting on them while I decide for sure what I’d like to do. Made to orders and new ideas are my top priority. I’m considering at least one Superstars sale each month, and Etsy will be relegated to the back burner. There are certain things I do like about selling on Etsy and I’m not ready to abandon it altogether. But… MY site is more important to me than some faceless corporate glom’s website, frankly. I’ve put my heart and soul into z-beads.com for years, and I’ve been too neglectful of it for the last couple of those years. It’s mine, I am in total control of the content and appearance – my husband and I built it from nothing but cursory knowledge of HTML and a whole lot of love and passion for doing things our way and making our own rules. When I put together my Superstars, I enjoy being able to use MY templates, my colors, asterisks and parentheses and colons wherever I wish. I like that I can offer more personal service tailored to the buyer’s preferences. For example, I create an invoice specifically for the buyer, with shipping already combined, insurance or no insurance, and the biggest advantage of all: they can send payment within a window of time, not RIGHT THIS SECOND. Sometimes we must move bigger things around to make the small treats possible. My patrons make my small treats possible, so it’s the least I can do to extend a little wiggle room. I hope you guys are excited about this shift, or can at least get used to the idea. If it doesn’t work for whatever reason, the nice thing about this, and life as we know it, is that nothing is permanent. Another thing that’s had my attention is basketball. I never thought I’d say that. Now, this doesn’t mean I’m officially a sports fan. I have always preferred to watch basketball to just about any other sport. They actually DO stuff, unlike football, where they’ll play for about 5 seconds and then stand around and talk about it for 15 minutes. 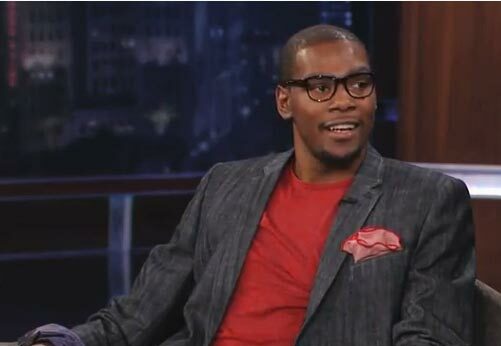 (OKC Thunder) Kevin Durant’s interview with Jimmy Kimmel several months back grabbed my attention. That kid is precious, and absurdly tall. Both his innocent humble quality and his deadpan delivery when he says something clever won me over. And the suit he was wearing in the interview was simply excellent. Check out the smart charcoal (denim, maybe?) jacket and pants set and the red t-shirt… and can you get over that light red/dark red trimmed hanky in his pocket? Talk about primo style without needless flash. And that shy smile, goodness gracious. It isn’t so much that I’d like to climb him… it’s more like I want to hand him a puppy. His mom seems to attend each of his games, which is even more adorable. And of course, there was that thing when LA Lakers’ Metta World Peace (I’m pretty sure that little chunk of irony isn’t lost on anyone) elbowed James Harden in the head so hard that he knocked him to the ground, which resulted in a mild concussion for Harden. It could have been so much worse, it seems these days you can kill someone by hitting them just right. I’m not sure if that says more about the over-all health of peoples’ brains, or the escalation in violence we’ve seen in the last decade or so. Whichever, it isn’t cool to be a jerk in basketball or anywhere else. Oh, well, the poor Thunder was ultimately trounced by the Heat in the national championship. My mind boggles at how much they get paid whether they win or lose, so who cares? Maybe the folks who bet their rent money. That’s really my only objection to sports: people can get downright silly about sports and not always in a fun kind of way. Anywhoodles, I’m planning a Superstars sale this week. Yes, I guess it’s sort of short notice, but if I’m going to be doing this with any type of regularity and good planning, I’m better off making beads and taking photos and sending notifications instead of jabbering on about my idle curiosities and my first world problems. One of the mysteries I’ve discovered in my little nook is my tastes compared to those of the folks who collect my beads. It’s pretty much a given that my buyers and I have similar tastes – I make what I like and they buy what they like. My sales are a great way for me to find out what people REALLY like, and at this sale, the most requested set was Mossy Mirror. I was sure that out of all the selections, this one would be passed on. Imagine my surprise. My theory is that people who like green have a hard time wearing green accessories and finding clothes that match. I’m one of them, I’d wear red or blue or even purple before I’d wear green, as much as I like working with it. But in the Mossy Mirror set, the grey toned the green way down and lent it a more earthy feel without the presence of brown. Or maybe it wasn’t the green at all, and it was the grey. Mom and I went to the Gemfaire in Tulsa last Friday. We had never attended a Gemfaire show. The weather couldn’t have been better – cool and just rainy enough to keep it that way, and light enough for driving 70 on the turnpike. It wasn’t a bad show, but more and more, most of what I see at these shows is that flashy sparkly Chinese crystal and not too much of anything noteworthy. I have a few strands of the crystal myself, it has its place, but it’s almost too much to look at. Perhaps the shows that come to OK lack vendors who sell higher quality beads… Maybe I would rather not resign myself to the possibility that it’s the only stuff around right now. I’ve decided that out of all the shows, Bead Renaissance is my favorite because of some of the vendors that are reliably there every year. Bokamo, Jane’s Fiber and Beads (although I didn’t see them last Bead Ren) and a new one (to me) that I hope will pass through again, April Melody. And if you know any of these sellers, you’ll surmise that I prefer higher quality new and vintage glass and seed beads. 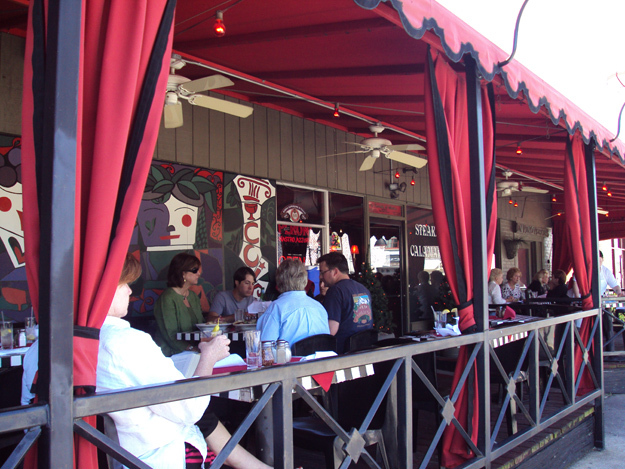 The highlight of the trip, however, was our visit to Tucci’s italian restaurant. We go every time we go to Tulsa. It’s small, dark and a bit cramped, but it’s clean and the service is perfect and the food couldn’t be better. Mom and I discovered this place quite by accident in 08 or 09 on one of our bead trips. I don’t remember what compelled us to wander in there, but we thought we’d give it a chance because we were starved and didn’t feel like finding anything else. They brought us the menus and we decided on the trusty old pizza and salads, not expecting much – but the price was right, about $20 for a slightly larger than small pizza and two lemonata caesar salads. They brought out the salads first, and we were floored. Lemon and oil dressing with delicate herbs and garlic with lettuce and very fresh shredded parmesan. Then came the pizza, and we went insane about the quality of the toppings, the cheese, the crust, the sauce… And the best thing was the perfect balance of all of it. This time we thought we’d try something different. We ordered the lasagna – $15 – but it’s huge and you’re encouraged to share the entree for $5 more. That $5 covers an additional sizeable lemonata salad and they divide up the lasagna for you. Now, I should tell you that I’ve never been big on lasagna. Every time I order it at a restaurant, it’s like they heated up a Stouffer’s. The pasta is too chewy and omnipresent, the cheese is too much and the meat is tough and the sauce is like Chef Boyardee’s. My Grandma Moran was a pretty horrible cook, but she learned how to make lasagna from her Italian neighbor in New York, and it was so good that the family was always bugging her to make it. 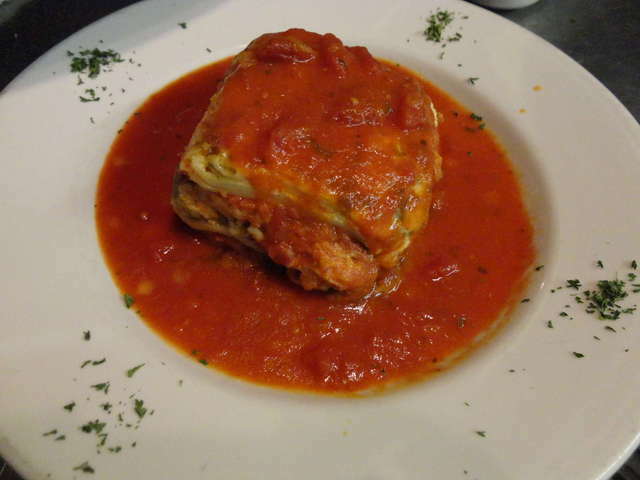 Tucci’s lasagna is just as good, if not better. The cheese is generally what I have a problem with, but it was obviously real cheese and it wasn’t dripping with it. In fact, as far as I could tell, ricotta was the only cheese they used and left the mozzarella off. The meat tasted like a meatball – a mix of ground beef and italian sausage, I assume – and it was very tender. And there was just enough pasta that you knew it was there, but it didn’t take over the entire dish, and it had the perfect consistency. But the sauce… oh dear. It was juicy without being watery and it wasn’t greasy at all, and you could taste the delicate herbs it was seasoned with. The over-all flavor of the herbs was just a tiny bit sweet – I’ve never been sure what that herb is and have never thought to ask, sweet basil maybe – and they did it right. Most Italian restaurants I’ve tried generally overdo this and it tastes like they dumped a bunch of sugar in the sauce, and it could be that they did just that by using bottled sauce containing HFCS. It ruins the entire dish, and it’s the sort of thing salt can’t help. Anyway, this was the best lasagna I’ve ever eaten. If you live in Tulsa and haven’t tried Tucci’s yet, stop being silly. At the moment, and for at least the last few weeks, I’ve been maintaining a daytime schedule quite well. So far, I’m enjoying it and am able to get a lot done in a day. I sleep better and feel better and find that my brain works better. I almost hate to admit it. I found that if I just get up in the morning and get the beads out of the way, it isn’t too hot in there. I also found that I have more time to do what I want to do in the evening and am more apt to get house chores done. The only thing I don’t like is the daylight. It makes me a little dizzy if I’m out in it too much. That, and the inconsiderate day people spilling their Starbucks and writing novels on their laptops while driving down the highway at 80mph. So far, early summer hasn’t been too awful. In fact, I wore a sweater outside yesterday evening. I can’t promise wanting to keep a day schedule come July or August, but who knows. I can only hope that this summer won’t be as bad as last year’s. 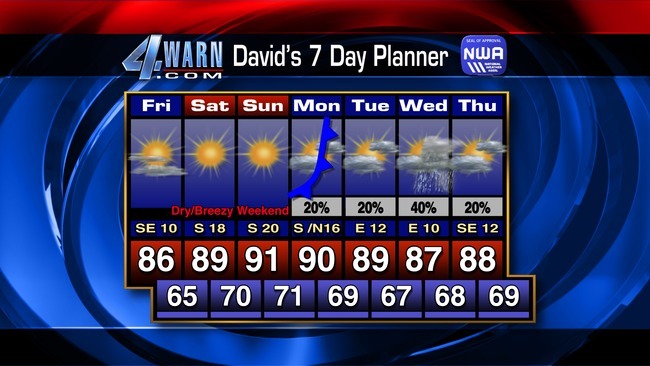 Not bad for June in OK. They would probably say this is “average”, but it isn’t, really. It’s been pretty much 90+ from late may to mid september as far back as I can remember. I haven’t even run the AC for the last few days. Miraculous! I’ve been enjoying and appreciating every second of it, and have gotten loads of made to order beads done. Well, loads for me is an average of about 9 beads each day. I have a few hours to kill before my hair appointment… maybe I ought to work on adding some stuff to my 2012 website gallery/catalogue. It’s been a while since I’ve had the werewithal to sit at the computer and get anything like that banged out.